On Aug. 21, 2018, the U.S. Food and Drug Administration announced to extend the expiration dates of specific lots of EpiPen 0.3 mg Auto-Injectors and its authorized generic version. Patients should have confidence in using the products from these particular lots as Pfizer works to stabilize supply, which is anticipated in the fourth quarter of 2018. Pfizer and Mylan's recommendation to extend the expiration dates of specific lots, and the FDA's decision were based on a careful review of data provided by Pfizer. We believe the extension of the expiration date will temporarily address patients’ access to and use of EpiPen 0.3 mg Auto-Injectors, and its authorized generic, particularly during back-to-school season as demand increases. The affected lots, which have current expiration dates between April 2018 and December 2018, are listed in tables in the expandable sections below and can also be found on FDA’s website. The extension of the expiration dates does not apply to EpiPen Jr (epinephrine injection, USP) 0.15 mg Auto-Injectors and its authorized generic version. Patients should continue to adhere to the manufacturer’s expiry date labeled on EpiPen Jr 0.15 mg and Epinephrine Injection, USP Auto-Injectors 0.15 products. 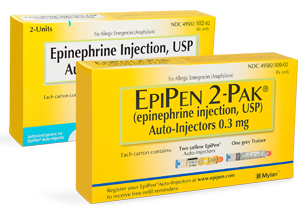 Lot number and expiration date for EpiPen 0.3 mg Auto-Injectors and its authorized generic are located on both the carton and auto-injector itself. Please see example images. You can confirm if your auto-injector's expiration date has been extended by checking if its lot number matches any of the lot numbers listed in the expandable sections below. If you have any questions regarding the lot number or expiration date of your auto-injector, please call Mylan Customer Relations at 800.796.9526. For general inquiries, please contact Mylan Customer Relations at 800-796-9526 or customer.service@mylan.com. Mylan Customer Relations hours of operations are Monday through Friday, 8 a.m. to 7 p.m. ET. 1. What is the reason for the supply constraints? Mylan’s manufacturing partner Meridian Medical Technologies, a Pfizer company, continues to experience interruptions in the production of EpiPen 0.3 mg and EpiPen Jr 0.15 mg Auto-Injectors, and the authorized generic version of these strengths. Over the past few months, there has been intermittent supply of EpiPen at wholesalers and pharmacies. Pfizer is working hard to increase production and stabilize supplies, but until this occurs, supplies of EpiPen 0.3 mg and EpiPen Jr 0.15 mg Auto-Injectors, and the authorized generic versions of these strengths, will continue to vary from pharmacy to pharmacy and may not always be available. 2.	Who manufactures EpiPen and EpiPen Jr? Meridian Medical Technologies, a Pfizer company, manufactures EpiPen 0.3 mg and EpiPen Jr 0.15 mg Auto-Injectors, and the authorized generic versions of these strengths. 3. What is Mylan’s role? Mylan sells and distributes EpiPen 0.3 mg and EpiPen Jr 0.15 mg Auto-Injectors, and the authorized generic versions of these strengths. Mylan is not the manufacturer. 4. When will the supply constraints be fully resolved? Pfizer anticipates supply will stabilize in the fourth quarter of 2018. 5. What are Mylan and Pfizer doing to resolve the supply constraint? We believe the extension of the expiration date will temporarily address patients’ access to and use of EpiPen 0.3 mg Auto-Injectors, and its authorized generic, particularly during back-to-school season as demand increases. Pfizer is working tirelessly to increase production. Mylan is expediting shipments upon receipt from Pfizer. We also are working closely with Pfizer to stay informed of anticipated shipments and are maintaining regular dialogue with health authorities to provide frequent updates on supply status. 6. Does the supply constraint affect the EpiPen4Schools® program? Mylan is continuing to support the EpiPen4Schools program, which offers four free epinephrine auto-injectors to qualifying public and private kindergarten, elementary, middle and high schools in the U.S. each calendar year. In May, we communicated to all schools participating in the program that given Pfizer’s intermittent supply constraints of EpiPen Auto-Injector 0.3 mg and EpiPen Jr 0.15 mg Auto-Injectors, and the authorized generic versions of these strengths, there may be delays in order fulfillment until supply levels stabilize. 7.	Who should I contact if I have additional questions? If you have an inquiry of a medical nature related to EpiPen Auto-Injectors or to report an adverse event, please contact Mylan Medical Information at 1-877-4INFO-RX (1-877-446-3679) or MylanMICC@Mylan.com.